A conversation on Facebook with a former kindergarten colleague had me thinking about mentors and role models. (Rachel had completed her course work and practicuum and recieved her teaching credential. What a time for celebration and reflection.) I was trying to formulate in my mind the difference between the two and so I quickly did a Google search. I found this link for role model and this for mentor . It became evident to me one was the more passive and the other more active and collaborative. I will explain. I have had many role models (as you read this post I hope you can relate to some of the experiences I share), people who I looked to as “role models” that I aspired to emulate in my life. These role models have evolved over the course of time as I discovered that teaching was my passion. From my mother to the many teachers who impacted my thinking and influenced me. As I grew into my teacher role, my role models became my mentors as they guided me to help me understand what teaching entails; way more then the schooling/course work, degrees and titles! I asked questions, they observed, they guided, and I asked questions. These role models, people whose work I respected, who I observed interacting with children, laying the foundation of my teaching, became more than role models, they became my mentors. When I was floundering or at a loss I searched them out and they were there to listen, observe, support and guide. And even when I wanted answers (that need for immediate gratification still runs through me) they helped me find the answers and more questions for my self. What a gift to have ones’ role model become mentors. Along my journey in becoming “me” some role models I have never met or connected with. We live in a complex world and trying to understand it has been influenced by untold people. Some I learned about, read about, marveled about from the courageous Anna Frank and Elie Wiesel to the soulful journey of Harriet Tubman to the many writers like Charles Dickens, John Steinbeck and poets like Maya Angelou who brought their world into my life (and so many more). The role models who showed me how they overcame hardship and adversity. The role models who told me early on that each of us can make a difference. Although tangential as role models, their narratives, their stories touched me as I sought to understand them, and their place in history. So many influences on our lives, so many different role models out there. But who steps up to the plate becomes your mentor. Sometimes that mantel carries a heavy responsiblity, the honor not withstanding. When my colleagues refer to me as a mentor I beam with pride. Not boastful, but filled with gratitude, that they see me in this way. My intrinsic motivation reinforced by my actions. Rachel reminded me of that: my excitement in learning, my interactions, my concern and joy in working with students, colleagues and parents impacted her thinking and the road to her teaching. How wonderful when the mentor/mentee relationship is built on respect, trust and shared learning experiences. The connections stay with us for many years (I have been so fortunate to be have reconnected to one of my mentors, Beth.) as we share our teaching stories. And I realized that as a “mentor” I am grateful to those who came before me, those who helped me along my journey. We are not an island unto ourselves and I have always know that. If you have a moment I’d love to hear your story, whether as a mentor or mentee. I love this quote. 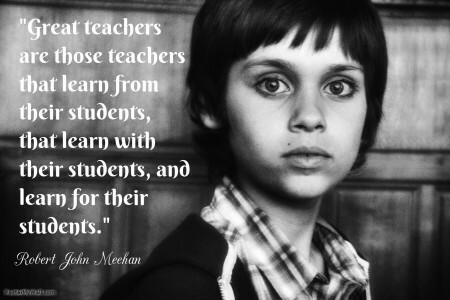 The student/mentee and teacher/mentor as we learn from each other. This entry was posted in Uncategorized and tagged education, mentor, role model, teaching. Bookmark the permalink.